“I now decree the convocation of the 36th General Congregation, in the name of the Father and of the Son and of the Holy Spirit.” With these words, on December 8, 2014, Father Adolfo Nicolás convoked the 36th General Congregation of the Society of Jesus, and set October 3, 2016 as the opening date. As required by the Formula of a General Congregation, the preparatory phase was a two-year process. 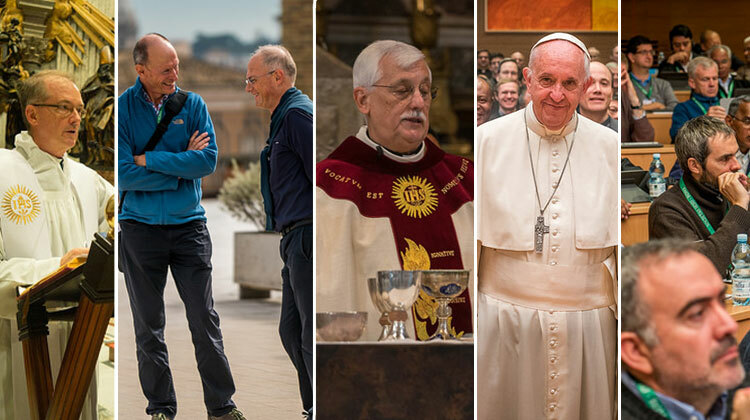 Two of the main reasons that led to the convening of General Congregation 36 were to elect a new Superior General, and to review the guidelines of the Society for the foreseeable future, with particular emphasis on new governance structures. The Plenary Session officially began the evening of October 2, with a Eucharistic celebration in the Church of Gesù, presided over by the Master of the Dominican Order, Father Bruno Cadoré, OP. In his homily, Father Cadoré urged the Society to have the “audacity for the improbable“, a leitmotif that members of the congregation have returned to several times in the Aula sessions. The next day, October 3, the 215 electors gathered in the renovated Aula of the Congregation at the General Curia. At the beginning of the first session of the Congregation, Father Adolfo Nicolás announced the appointment of Father James Grummer as Vicar General. He would serve as Vicar until the election of a new Superior General. One of the first formal acts of the Congregation was the acceptance of Father Adolfo Nicolás resignation. Then the congregation entered the stage of “De Statu Societatis”, a period of reflection on the current state of the Society in the world. The purpose of the period was to help in creating the profile of the man who would be best suited to govern the Society at this historic moment. On October 10, the Congregation entered the phase of murmuratio, four days of prayer, one-on-one conversation, and personal reflection to identify which person could match the profile sought. On 17 October, the Congregation, led by the new Superior General, entered the “ad negotia” phase, a stage where important issues affecting the ordinary life of the Society are discussed. On October 24, as tradition dictates, the Electors met with the Holy Father. An historical meeting, being the first Jesuit Pope. In his address, Pope Francis reminded the Universal Society the importance of the discernment coming from the Spiritual Exercises. These days the delegates are working on some specific topics. They will have to decide whether it is worth turning them into decrees, or public documents that will become heritage of the universal Society. Over the next few weeks, the new government of the Society will take shape, with the election of four Assistants ad Providentiam and the appointment of regional assistants. The Assistants ad Providentiam, are elected by the Congregation delegates and have the task of advising the General about his health and his style of governing. The Regional Assistants, help the General on issues related to geographical regions called Assistancies.